With the announcement, via its blog, of the acquisition of the Fairholme collection by the Canadian Museum of History, we can now add one more to the short list of photographic portraits of the officers of the Franklin expedition. The original Daguerreotypes were made by Richard Beard and his franchises, who formed one of only two British patent holders of the process in 1845 when they were taken. At the time, portraits were the primary stock in trade, and both Beard and his rival Claudet sought to find ways to make more of them more readily available -- both by reducing the exposure time, and exposing more plates. According to an 1841 article in The Spectator, Claudet used two cameras at once, each focused on the sitter from a different angle, while Beard's operators simply exposed two plates one after the other. Beard's method allowed for a pause between exposures, and sitters were able, if they wished, to shift their pose. Of the photographs of Franklin and his officers, we have an image of this second plate for only four -- James Fitzjames, Henry Thomas Dundas Le Vecsonte, Charles Frederick Des Voeux, and now James Walter Fairholme. 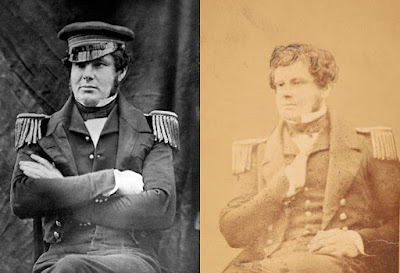 This tells us a number of things: that Lady Franklin was present when the image was taken and/or presented, that Fairholme sent one of the two plates to his sister, and that he'd borrowed Fitzjames's coat for the portrait. Indeed, it appears from all the evidence I've seen that it was Lady Franklin who'd commissioned the Beard portraits, or at least she who oversaw them; it appears likely that she herself took one of each of them, leaving the second for the individual officers to dispose of as they liked. This is confirmed -- but also complicated -- by a remark in a letter by the Erebus's Ice Master James Reid: "Lady Franklin has ordered all the officers' likenesses to be taken, and mine among the rest, with my uniform on. She keeps them all by herself." (see Andrés Paredes Salvador's excellent blog post on Reid, "Willing to Go," for more details). Reid's remark suggests that perhaps not all of the officers were offered -- or perhaps felt they could afford -- a second portrait, for which Beard's going rate was a guinea. If Lady Jane was paying only for her own set, the additional cost might well have been off-putting to a career whaler such as Reid; a guinea in 1845 is the equivalent of nearly £95 today! Even for those who obtained their own portraits were faced with the fact that a Daguerreotype is a one-off -- there's no way to make prints without re-photographing it. And so they turned to the Talbotype or calotype process, which created a paper negative from which paper prints could be made. The earliest example this is the large mounted set of fourteen of these portraits, apparently once the property of Franklin's niece Sophia Cracroft, which consists of high-quality salted paper prints of each plate, including several the originals of which have not survived -- it was made quite early, no later than 1851). Fairholme's is also a salted paper print, which suggests an early date, although such prints could be made at any length of time from when the negative was taken. We'll want to be on the lookout for more of these "seconds" -- it seems very likely to me that Beard's operator was directed to make two exposures of each sitter -- the same research that's been undertaken to find descendants of Franklin's men for the purpose of obtaining DNA samples may also turn up further images of this kind. My thanks to Geoffrey Batchen for his expertise, and for referring me to the Spectator article! NB: The second image of Le Vesconte is not, as it turns out, a second plate exposed at the original sitting, but a Daguerreotype copy of the original (thanks to Peter Carney for pointing this out), so in fact we only have three true "seconds."